Yu Yangyi is one of the very few players in the world to jump into the Grandmaster title without ever having any previous title. 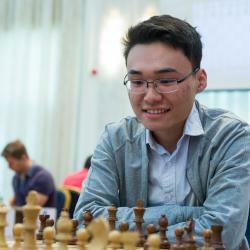 One of the quickest rises to Grandmaster status ever, Yangyi earned his 3 Grandmaster norms within two(!) tournaments in less than two(!) weeks! Now that he’s the third best junior player in the world, one of China’s top Grandmasters and one of the best players of any age in the world, no doubt he will continue this incredible rise and head toward the peak of the chess mountains with the other titans. Yu Yangyi learned to play chess at a young age and quickly had success. He tied for second place in the World U-10 Championship in 2003 and followed that up with winning the same section the following year in 2004. A few years later in 2007, Yangyi came in second place in the Aeroflot Open Group C. The next year, in 2008, he played in the same tournament’s group B and came in third place. In 2009, he came in second place at the Zhejiang Lishui Xingqui Open behind Le Quang Liem. It was in 2009 that Yangyi had his breakout year. As an untitled teenager, he came in third place at the Asian Continental Championship which earned him two(!) norms. This is because the tournament had a continental status and qualified for a double norm. The following week, Yangyi had a great performance as well at the Subic International Open and won another Grandmaster norm. With his three Grandmaster norm requirements already completed, Yangyi was awarded the Grandmaster title without ever having any previous title. After getting this title, he tied for first at the Asian Individual Championships in 2011. In 2012 he came in second place at the Chinese Championships and in the same year he tied for first at the Asian Continental Championship. In 2013 he achieved his peak rating of 2696. Recently in 2014 he won the Chinese Championship ahead of Ding Liren and also won the blitz tournament at the same event. Now that he is the third best junior player in the world, one of China’s top Grandmasters and one of the best players of any age in the world, Yangyi will be sure to continue improving. He has many more years ahead of him for some great chess results to happen.